Renowned Dagou Red-hat businessman Chen Jhong-he rose to prominence towards the end of the Cing Dynasty and during the Japanese occupation period; he was one of the most important entrepreneur and wealthy businessmen in Taiwan. He passed away in 1916, construction on his tomb began in 1930 and was completed in 1935, totaling five years. The tomb covers an area of 2,235 hectares; it adopts a Fukien style of tomb construction and combines Japanese and western Baroque styles from the Japanese occupation period. 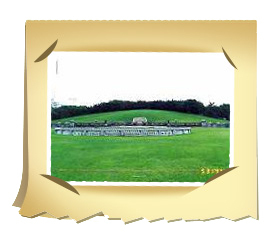 This is the one of the only few remaining renowned tombs that was constructed during the Japanese occupation period. The former residence of Chen Jhong-he was built in 1911 and completed in 1920. 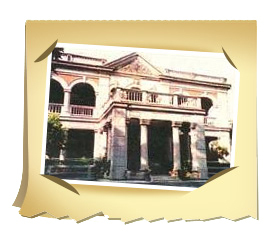 When it was constructed, it was the first Western building in the Kaohsiung region at the time (Japanese occupation); its magnificence had the meaning of a great mansion among all the Fukien style architecture. The main building of the Chen residence is in the form of a cloister with corridors surrounding the premise; the corridors not only form a second wall between the rooms and the exterior, but also act as a screen against rain in southern Taiwan, while structurally they also resist against any transverse external force. The floor plan of the architecture is in the form of nine blocks, where occupants are arranged according to seniority. The second floor of the interior is a viewing deck for admiring the ocean scenery; it is now used as an exhibition hall. The complex is comprehensively maintained and managed by the Chen Jhong-he Wong Charitable Foundation, which was established by the Chen family. The Cing Government strictly banned Catholicism until the end of the Opium War, when Emperor Sianfong promulgated the opening order for the preaching of the Catholic religion. 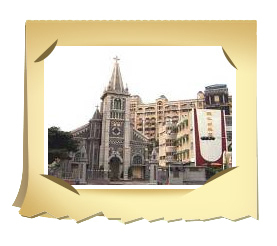 In 1858, Father Fernando Sainz from the Santa Domingo Church in the Spanish Philippines arrived in Taiwan from Amoy to preach. He settled in Kaohsiung the next year and in December of 1859, he constructed a thatched church at the present address with 62 silver dragons. In 1860, Father Fernando Sainz used 600 silver dollars to reconstruct it into a small brick and mortar chapel. In 1862, a cathedral was built using bricks, sand, gravel and cement; it was named Holy Rosary Cathedral Minor Basilica or Cathedral. 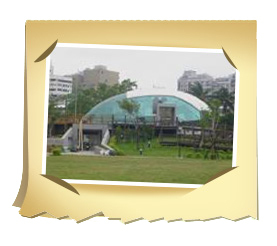 The first birthday park in Taiwan was born in Kaohsiung. The design draws inspiration from the egg-shaped digital architecture of House of Life to create the imagery of the vivacity of a life about to break through the egg shell, while a family fun house with the theme of 12 constellations is constructed nearby. Furthermore, there is also a sundial created from 12 ceramic plates featuring the 12 constellations to increase enjoyment. In addition, the pirate LEGO set provides a recreational area for children. There are five landscape artworks in the park, including the Fairytale Castle, Desire to Fly, Egg of Life, Joy of Birth and Shell of Birth. These facilities create the birthday theme through fairytales. Situated on Wufu 1st Rd., the simple architecture was built in memory of former President Chiang Kai-Shek. 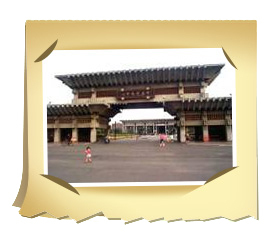 The multipurpose cultural building is divided into seven parts, including: anteroom and cultural museum, Chih-the Hall, Chih-shan Hall, memorial hall, conference room, library, gallery and children's library. The lighting, sound and stage facilities at Chih-the Hall are the most cutting-edge in Taiwan, perfect for plays, singing and dancing performances. 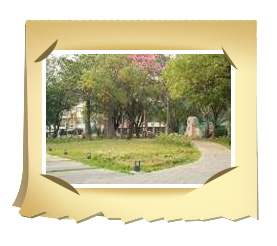 The lush and spacious Jhongjheng Park nearby is an ideal location for leisure activities. The Rainbow Park is situated near Lingya District, close to the Jhongjheng and Liouhe shopping districts. 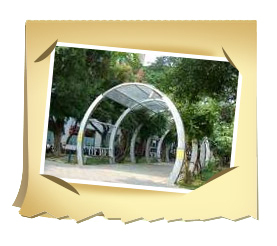 The arch tunnels in the park are interconnected to form a green trail leading from Jhongjheng Park to Liouhe Rd. When the sunlight shines on the lush green strip, rainbow colors of red, orange, yellow, green, blue, indigo and violet glitter like fairies of rainbow mischievously dancing on the green corridor, creating a secluded Arcadia within the bustling Jhongjheng shopping district.ral. This is located at the intersection of Chenggong Rd. and Singuang Rd. It is a unique example of architecture, with white as the main color and round design concept; this is from where its name is derived. The mast-like architecture is very special. The Ocean Star is situated next to Kaohsiung Harbor; walk up the spiral staircase and the magnificent harbor scenery can be observed. This is also a popular location for wedding photographs; the newlyweds who come here to take pictures add a touch of romantic atmosphere to the Ocean Star. This is also one of the stops for the Kaohsiung Do-Do Train, Singuang Station. 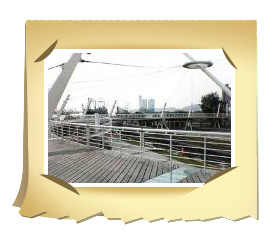 One may take the train to tour the Kaohsiung Harbor area and appreciate its diverse appearance. The flower park is situated net to the Sihwei 3rd Rd. in Lingya District, between Wunwu 3rd St. and Zihjiang 3rd Rd., opposite the rear entrance of Lingjhou Elementary School. It is a small park with an area of 0.68 hectares, yet it features more than 70 species of plantation. Although the quantity of the plantation is not large, over 90% of them belong to the fragrant flower family. Next to the towering Ceiba pentandra and the lush camphor trees on Sihwei Avenue, the park's symbolic entrance features an inconspicuous gilded sign, while the surrounding area is planted with shrubs such as Thai Hemigraphis trees, satinwood, Cape jasmine and Pink ixora. They are complemented by White justicia, Catharanthus roseus and Schefflera arboricola, forming an open space for the local residents. 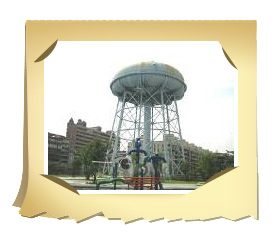 The Water Tower Park is located at the southeast street block of the intersection of Wufu Rd. and Guanghua Rd. The main entrance is at the Wufu Rd. side, while the arch shaped entrance imagery is created at the northeast corner of the park, featuring optical fiber strips connected to a glass mosaic map of Kaohsiung. The sidewalk features plantation and LED lights to provide a superior pedestrian walking space. The existing water piping is painted and transformed into installation art to accentuate the theme of the park. A dozen years ago, there were not as many florists as there are now at the flower market. 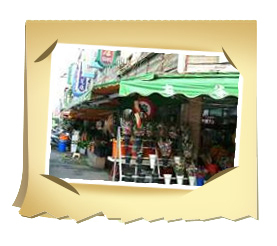 Later, due to the congregation of stores, together with promotion by the City Government, the area gradually developed into a specialty market. Recently, through attention from the Department of Commerce of the Ministry of Economic Affairs and the City Government, as well as standardized billboards and various promotional & marketing activities, the flower market has become a well-known destination. With a significant increase in the number of visitors, local citizens also become used to purchasing flowers from the Singjhong Flower Market. Whether to give away as a gift, decorate the home, for festivities or other occasions, every type of bouquet, flower basket or wreath can be found here. 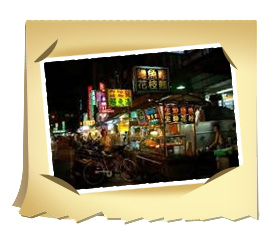 Going to night markets is the most popular leisure activity for the people of Kaohsiung. The Guanghua Night Market consists mainly of delicacy stalls that offer a wide variety of northern and southern snacks. For visitors, this may not be a well-known night market; however, for local residents, it is a gourmet paradise which offers economical and delectable snacks! The so-called Guanghua Night Market is actually a centralized location for delicacy stalls. It began as a collection of vendors around the Guanghua Cinema in the 1960s. Later, due to the dramatic increase in both stalls and consumers, the vendors gradually expanded to the east and west side of Guanghua 2nd Rd. and behind the Guanghua Cinema to form three independent night markets.